What renders summers and vacations more special and unforgettable? Well, almost everyone will agree, it’s the travelicious destination such as Sardinia (sometimes written as Sardegna or Sardenia) of Italy. Sardinia, as most well-travelled tourists (particularly, the Europeans) must already know - is considered one of the world’s best summer capitals. It’s an island in the southwest area of the Italian archipelago. It is definitely a must-see/visit place when you’re in Italy, otherwise, you will have missed half of what Italy has to offer, in terms of geographical and cultural uniqueness. Sardinia is also home to an infinite number of major aquatic and natural paradise such as the Carloforte (Charle’s Fort), a fishing and resort town located at the sulcitan town of Isola Di San Pietro (Saint Peter’s Island). The entire province prides itself with rich historical and natural heritage, some of which, include the famous Le Colonne di CarloForte (The Columns of Charles Fort) and Grotte del Pulpito (Pulpit Caves) and the clear blue waters, to name a few. It wouldn’t be that difficult to hunt for low-cost accommodations (as low as Euros 50;rate for a double bed room, inclusive of breakfast and dinner) and a beach area within a walking distance from your pensionhouse or a nice restaurant catering the savoury Italian delicacies. It might not be as spectacular as the more populated side of Sardinia which is Porto CervoOlbia Tempo, but nevertheless, you’ll be spending almost half of what the Olbia visitors are spending, in an equally captivating location. Plus, the fact that you can enjoy a more serene environment. 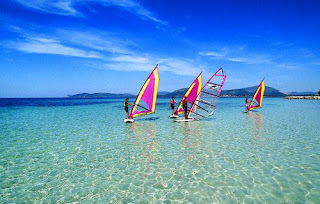 The best time to enjoy Sardinia is during the summer(from July to September). So have a good time and happy holidays, everyone!